It’s time to go on a diet. In fact, it’s long overdue. I’m not talking about embracing a cupcake-free lifestyle or swearing off cheese. That would be cruel and unusual punishment. However, what I’m proposing is becoming aware the amount of heating oil we are consuming each winter and taking incremental steps to move toward renewable heating sources. During our first big snowstorm of the year last week, I cozied up by the fire and got to thinking about heat: the necessity of it, the convenience of it, the importance of it, the repercussions from it, and the cost of it — for the consumer as well as for the environment. When it comes to heat, I encourage you to remember just one number this winter: 324 million metric tons. This is the amount of carbon dioxide emissions we produce in the US every single year as a result of heating our homes. It is essentially our national “weight” and it’s time we as a country come together and try to lose a few million tons. If you’re like me, you may have trouble envisioning what 324 million metric tons of carbon actually looks like. It’s an seemingly incomprehensible number. I struggled to find a way to tangibly grasp just how big 324 million metric tons is. I found a way to better understand the scale by viewing the work of environmental communicator Antony Turner. His breathtaking visualization of carbon emissions can be seen in many of his projects but is particularly compelling in his three-minute video showing the 54 million metric tons of carbon dioxide New York City produces in a year. Check it out here. While this video shows the staggering size of 54 million metric tons of carbon, it still can’t show how much carbon we really produce as a by heating our homes. New York City’s mountain of carbon is a mere 16 percent of the 324 million metric tons we produce. 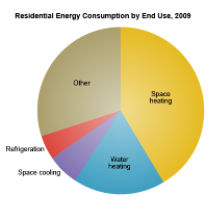 The Environmental Protection Agency (EPA) found that space heating accounts for about 42 percent of energy use in U.S. residences and space heating accounts for 30 percent of homeowners energy-related expenses. Whereas only 5 percent of US consumers heat homes with oil, 25 percent of homes in the Northeast rely on heating oil. Nearly one-half of all Vermont households use fuel oil or propane to heat their homes. The US Energy Information Administration (EIA) goes on to show that 60 percent of all energy consumed in Vermont is petroleum-based and is used for home heating and transportation. The need to get off oil dependency is even more critical when we reflect on the fact that Vermont does not produce or refine any of its own petroleum, instead relying on out-of-state and out-of-country producers. This not only poses a potentially dangerous vulnerability if oil shortages occur in the future but goes against our state’s strong values of independence, local products and sustainable local economies. For the month of January, we’ll explore the search to find renewable heating sources that will enable us to break free from dependence on oil for heat. Some of these renewable sources include solar thermal systems, geothermal heating, ground source heat pumps, air source heat pumps, biomass boilers, wood pellets, wood stoves, and more. Stay tuned! Do Just One Thing: Make a New Year’s Resolution to research alternative, renewable heating sources.